We know you’ve created lists of contacts in Excel or Word and saved them — maybe even for years! — to folders on your computer. You can now take these offline lists and replicate them in EverTrue so you can take advantage of the in-depth insights available only in our platform. Just copy and paste a list of emails or user IDs and load them directly into EverTrue! Copy a list of up to 500 email addresses and/or user IDs into the Create a List tool to enter it into EverTrue. We'll then match those emails and IDs to records in seconds, allowing you to dive deeper into that specific group of people. Choose “Create New List” from the left-side EverTrue menu. Give your list a name. Make it something that’s both descriptive and easy to remember so you can find it later. Select either Email or Remote ID and then copy and paste your list bottom text box. You can now start to take a deep dive into that list and see how these users are engaging with your institution on Facebook, look up giving information, see their last gift date, and more. *EverTrue will only accept emails or IDs that match to records that your organization has already sent to our platform. If the email or ID is unrecognized, we will let you know. Already have a list, but want to add more constituents to it? 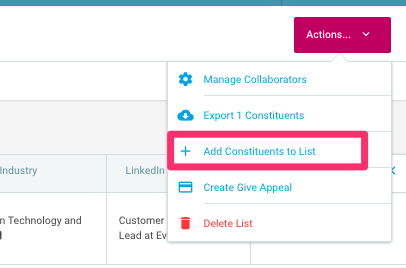 All you have to do is click on the list name to open, then click actions at the top right and select "Add Constituents to List." 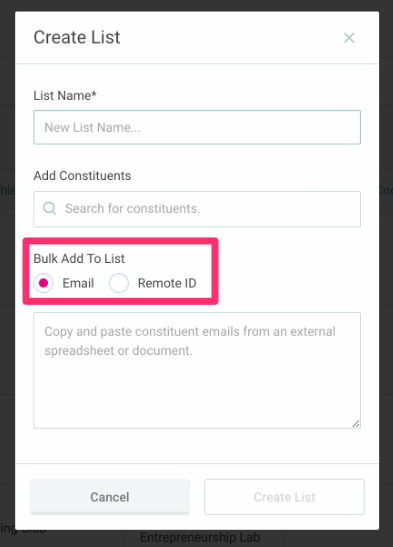 In the box that pops up, you'll have the option to Bulk Add To List using Email or Remote ID. Take a deeper dive into that Excel file you’ve been using outside of EverTrue for YEARS. Create a complex list of people directly from your database, then copy it into EverTrue to easily see interactions, career information, giving history, and more. Pop a list of event attendees into EverTrue to see their giving potential, how actively they engage with your Facebook pages, or check if they already have a gift officer assignment. Share a list of prospects directly with another EverTrue user (A class agent or volunteer fundraiser, perhaps?). Simplify outreach to parents by creating a contact list of one parent per family to avoid duplicate solicitations. Get additional intel on alumni who have registered for a reunion. Keep adding to this list as the registrations come in! Track gifts by volunteer group. Copy lists of Trustees, committee members, volunteer fundraisers, faculty, or staff and see if gifts have come in or create an appeal for those who haven’t yet made a commitment. Track giving potential, engagement, and participation among affinity groups. Use lists of alumni from other databases (fraternities, sororities, student clubs, etc.) to see how their participation and engagement rates stack up, then drill down for more intel to create better solicitations. Take a list of people you’ve invited to an upcoming event, but who haven’t yet responded. Look at the list within EverTrue and see who’s engaged with you recently and then reach out to them directly to help drive attendance.